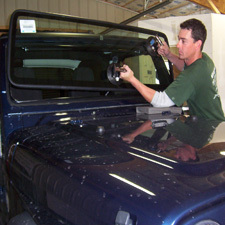 Windshields are an essential safety device in any vehicle. The windshield is the first line of defense against road debris and nature’s elements. The windshield helps to protect you in the unfortunate event of an accident. A properly installed windshield, combined with other important factory installed safety devices (like airbags, side curtain airbags, and seat belts), reduces the vehicle occupant’s risk of serious injury. Windshield replacement is a service that cannot be performed by anybody...it requires a professional and experienced team of specialists. If you are in need of such services, then you should know the best windshield repair and auto glass replacement company in the Ft. Wayne and Kalamazoo area is Precision Glass. Our auto glass replacement technicians are professionally trained and certified in the latest auto glass replacement technologies. Precision Glass uses only the highest quality replacement auto glass that meets or exceeds O.E.M specifications. We don’t cut corners to save money we simply provide the best possible windshield replacement service at the best possible price. Windshield replacement is indeed a job that has to be taken seriously and performed by someone with extensive knowledge in the field. Don’t put your family’s safety in the hands of just anyone; choose the auto glass replacement experts at Precision Glass. We are approved by all major insurance carriers and will gladly handle your insurance claim paperwork for you. For your convenience, we also offer mobile service. If you're in need of auto glass service, contact us today or click here for a free auto glass estimate.